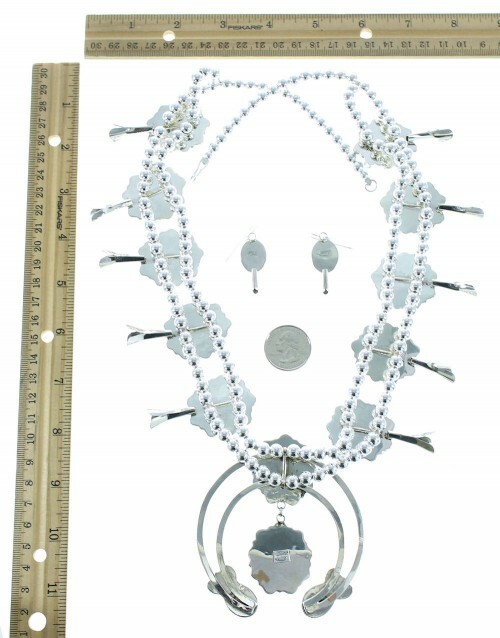 Necklace measures approximately 28-1/4" inside circumference, allowing the side links to measure approximately 1-1/4" long, and 2-1/8" wide, while the center piece measures approximately 3-3/8" long and 3-1/8" at widest point. 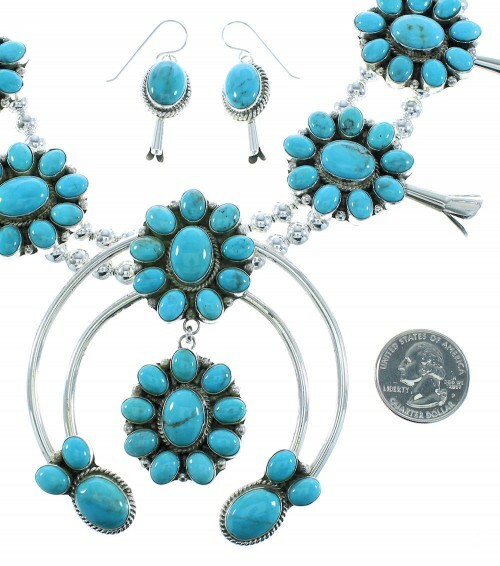 Matching hook dangle earrings measure approximately 1-3/4" long (Including hook) and 1/2" at widest point. The necklace weighs approximately 222 grams. This is a very exquisite Squash Blossom that must not be overlooked! This Native American jewelry set is Navajo hand crafted and strung by artist M. Begay, out of genuine sterling silver and real Turquoise stones. 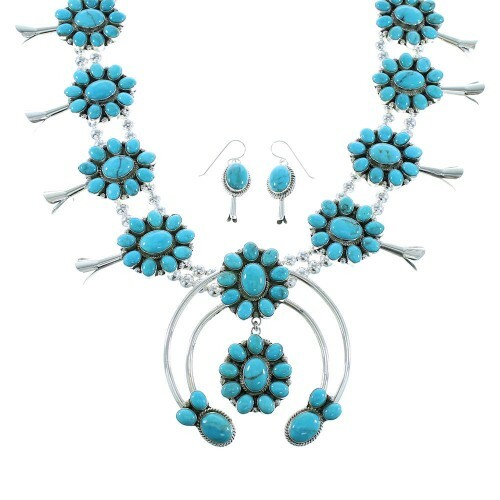 The necklace is composed of one Naja (the crescent-shaped large center pendant) and double strands of 7-mm silver round beads that are placed at regular intervals among the round side of the center. 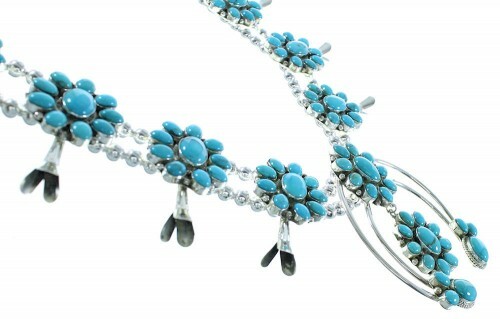 The Naja is set with TWENTY SIX stones, while each side of the necklace has FIFTY stones that are attached to THREE silver petals which are called squash blossoms. All of the stones are gently set in hand cut bezel settings, while being accented by twisted silver for a fascinating look. Entire traditional necklace is flexible "not stiff". 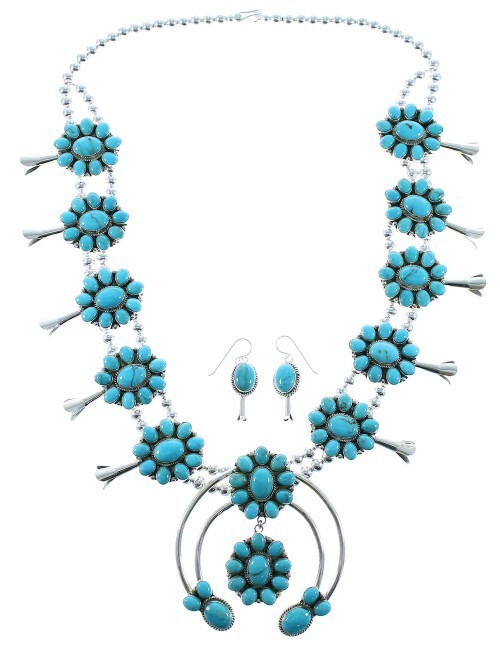 The earrings have a total of TWO stones (ONE in each earring) and perfectly match the necklace for a lovely finish to this set. The set is stamped sterling and hallmarked by artist. This entire set has a total of ONE HUNDRED AND TWENTY EIGHT stones.